Microsoft followed through with the general release of an important cloud service last week, laying the groundwork for real-time insight with Azure Stream Analytics. As the name suggests, Azure Stream Analytics (ASA) is about analyzing data in flight. Examples include data flowing from devices, sensors, web sites, apps, and infrastructure systems. Analysis is done with a SQL-like language that lets users visualize, alert, and act on events in real time. Introduced as a technology preview last fall, ASA has been used by beta customers in use cases including smart-grid management, predictive maintenance, and remote device monitoring. 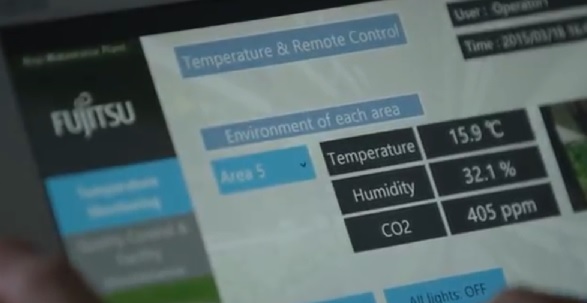 Japanese technology manufacturer Fujitsu, for example, used Azure servcies including ASA to capture sensor and machine data within one of its factories so it cloud pioneer environmental monitoring capabilities. That ECO-Management Dashboard (shown below) is now part of a larger IoT/M2M platform that teams Fujitsu devices with Azure services to support industrial monitoring and analytics. Microsoft says ASA offers faster development and simpler coding compared with Java-centric streaming options such as Apache Storm. You could also read that as a dig against Google, which last week announced that its beta Google Cloud Dataflow service is available as a preview. Announced about a year ago and designed to support both batch and stream processing, Dataflow is aimed at Java and Python developers. The service includes an open-source Java SDK and work is underway to support Apache Spark, another streaming-data-analysis option. What Microsoft didn’t mention is the fact that it’s playing catch-up on the streaming front with Amazon Web Services, which made its Kinesis streaming data ingestion and processing service generally available more than a year ago. In a reversal of those roles, however, AWS was the follower two weeks ago when it introduced Amazon Machine Learning, lagging behind Microsoft’s July preview and February general release of the Azure Machine Learning service. Forget the horse race. We’re at the very beginning of a mainstream push into real-time analytics. Complex event processing vendors that have long supported financial trading floor operations and intelligence agencies have been talking about the mainstreaming of real-time performance for years. It looks like the cloud is finally making streaming data analysis broadly accessible. Two years from now, nobody will remember which cloud provider was the first to deliver a stream processing service. Stream processing and analysis is table stakes for building real-time, data-driven applications. Indeed, Azure Stream Analytics and Azure Machine Learning are two key components of a Microsoft Azure IoT Suite announced last month and set for preview release in the second half of this year. Microsoft says the Azure IoT suite will offer three ready-to-customize applications: remote monitoring (think KPIs from remote devices), asset management (controlling remote devices in some way), and predictive maintenance (monitoring and analyzing performance over time so you can avoid unplanned downtime). Microsoft is far from alone in the IoT arena. In fact, the likes of General Electric, Cisco, Intel, and SAP already have elaborate IoT plans in place. Constellation Research IoT expert Andy Mulholland informs me that each has an important roles to play: GE on Industrial Internet apps (where it has been a pioneer), Intel on data security, Cisco on network and fog computing intelligence, SAP on industry business processes IoT apps. None of these companies can match Azure’s global cloud footprint, so that’s where Microsoft can shine with broad services capabilities that are designed to work with it popular software. A closer competitor to Microsoft will be IBM, which late last month announced plans for a dedicated IoT business unit. IBM says the business will be staffed by more than 2,000 consultants, researchers, and developers, and it has pledged to invest $3 billion over the next four years. IBM, too, offers broad cloud services, but it’s also taking an industry-focused approach, eyeing vertical apps, partner networks, and entire industries. One early offering is an insurance app framework designed to tap into connected vehicles so insurers can use real driving data to set rates with a better understanding of risk. IBM is also building out a data and industry ecosystem for IoT. For instance, The Weather Company, parent of the Weather Channel, plans to run its business-to-business weather data platform on IBM Softlayer, and IBM IoT customers will be offered both streaming and historical weather data. Imagine real-time weather data combined with sensor data to optimize supply chain delivery or stocking of products with historical knowledge of weather-related buying patterns. Weather is clearly an important real-time decision factor (read Guy Courtin on floods, blizzards, hirricanes, and other supply chain disruptions). No surprise that Microsoft is a partner with Weather Company rival AccuWeather, which is running part of its infrastructure on Azure. All these investments should tell you that IoT and related services are not hyped up brochureware. It can start with simple internal applications. For example, I recently talked to JJ Food Service, a U.K.-based distributor that’s planning to use Azure services to monitor its more than 200 refrigerated delivery trucks via Bluetooth temperature sensors synced with driver smartphones. Drivers and dispatchers will be alerted when temperatures fall below levels where foods like ice cream and seafood would spoil. This is really an “intranet of things” app, Andy Mulholland tells me. If you want a sense of how sophisticated IoT apps can get, read Andy’s blog about how Harley Davidson has cut the time required to create a custom motorcycle from 21 days down to six hours. Practical intranet of things apps like the one envisioned by JJ Food Service show that IoT initiatives can start small with non-mysterious, non-bleeding-edge endeavors where you know there’s a return on investment. Look for simple, obvious use cases in your day-to-day operations to get your feet wet. With services accessible via the cloud, IoT (or small “i”, small “t”) apps will be easy to pilot without a huge commitment to building out real-time infrastructure. Previous Data to Decisions: Are You Missing Something Big?